President Barack Obama has announced that the US will not hesitate to take action against Islamic State (ISIS) militants in Syria as well as Iraq. In a nationally televised speech outlining his strategy against ISIS, Barack Obama said that any group that threatened America would “find no safe haven”. The president also announced that 475 US military personnel would be sent to Iraq but said they would not have a combat role. ISIS controls large parts of Syria and Iraq after a rapid military advance. The US has launched over 150 air strikes against the group in Iraq and provided arms to Iraqi and Kurdish forces fighting against IS. In a 15-minute speech shown at peak time in the US, Barack Obama vowed that America would lead “a broad coalition to roll back” ISIS. “Working with the Iraqi government, we will expand our efforts beyond protecting our own people and humanitarian missions, so that we’re hitting ISIL [Islamic State in Iraq and the Levant – the previous name for ISIS] targets as Iraqi forces go on the offense” he said. He said he would welcome congressional approval for the fight against ISIS but said that he had the authority to act without it. Barack Obama was elected in part because of fervent opposition to the 2003 invasion of Iraq, and presided over the US troop pullout from the country. In 2013, the president abandoned plans to launch airstrikes in Syria against government forces after congressional opposition. In his speech, Barack Obama ruled out working with President Bashar al-Assad of Syria, despite the fact that his forces are also engaged in fighting ISIS. “In the fight against ISIL, we cannot rely on an Assad regime that terrorizes its people: a regime that will never regain the legitimacy it has lost” he said. Instead, Barack Obama said, the US would seek to strengthen the non-ISIS Syrian opposition, which fights against both ISIS and President Bashar al-Assad. Syria’s Western-backed National Coalition welcomed Barack Obama’s plan, and urged Congress to approve it. “The Syrian Coalition… stands ready and willing to partner with the international community not only to defeat [ISIS] but also rid the Syrian people of the tyranny of the Assad regime,” its president Hadi al-Bahra said in a statement, quoted by Reuters news agency. Secretary of State John Kerry is already in the Middle East trying to build a coalition against IS. John Kerry was in Iraq on Wednesday, where he praised the new government’s plans to involve more Sunnis in government and heal ties with the Kurds. He said the president’s strategy “will succeed because doing it with allies and partners isn’t just smart, it’s strong”. 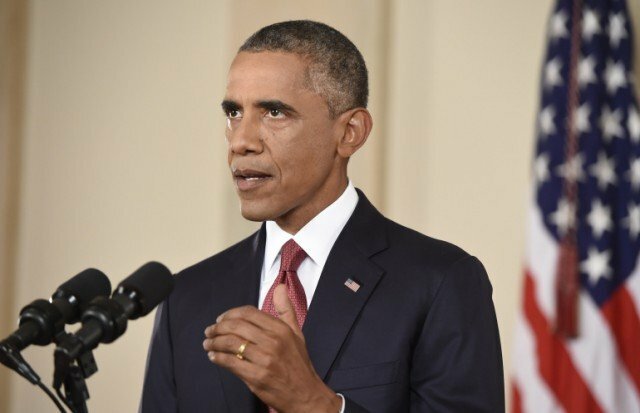 Barack Obama has already authorized $25 million in aid for the Iraqi military.